LAST Night (local time) the tiny south Pacific nation of Vanuatu, formerly a Spanish colony from the 1600s, and then a joint French-British territory (the 'New Hebrides') before regaining independence in 1980, was smashed by one of the most severe hurricanes to have ever hit the South Pacific region, with hurricane strength winds up to Category 5..
ON this evening's news it's reported that "dozens" of people might have been feared dead..
ABC News, Sydney wrote: At least eight people have died in Vanuatu, a senior aid official says, in one of the strongest tropical cyclones to have hit the South Pacific. It comes amid unconfirmed reports that more than 40 people may have perished elsewhere in the country as a result of Cyclone Pam. The official death toll in Port Vila stands at six, with another 20 confirmed injured, according to Vanuatu's National Disaster Management Office. One person has also died in Papua New Guinea's West New Britain province after a tree fell onto a house during strong winds driven by the storm. Vanuatu coordinator of climate change not-for-profit organisation 350, Isso Nihmei, said he and others tried to rescue three people in Port Vila who later died in hospital. "We heard some of the people who were living close. They were shouting and calling us. So once we went down there, we saw this guy who was already dead," he said. "There [were] other people on the other side, so we went down to rescue them but they were really weak. "We got them to hospital but they died in half an hour." 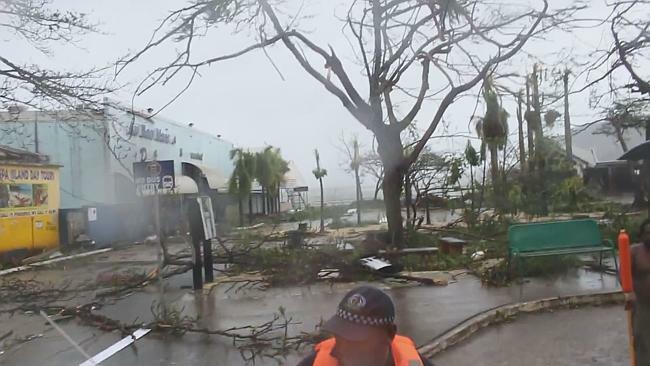 AUSTRALIA stands ready to help Vanuatu and other Pacific nations battered by Tropical Cyclone Pam with many feared dead, including in the capital Port Vila. Vanuatu has been hit by destructive winds, rain, flooding, landslides, sea surges and very rough seas. The Oxfam Vanuatu country director Colin Collett van Rooyen, tonight told The Australian: “Tragically we have already seen the confirmation of six fatalities in central Vila and we are expecting that number to increase markedly as more assessments come in from further afield. “This cyclone has devastated this country and the impact on the people of Vanuatu will be huge,” he said. The tropical cyclone is believed to have caused widespread destruction, with fears that dozens of people may have died. Pam is also likely to impact Tuvalu, Kiribati, Fiji and the Solomon Islands. Category five cyclone Pam hit the South Pacific island chain on Friday bringing flooding, high seas, and winds in excess of 250km/h. The centre of the storm passed the capital, Port Vila, overnight, and was reportedly moving south at about 25km/h on Saturday morning. There are unconfirmed reports of 44 deaths in the northeast Penama Province, the United Nations Office for the Coordination of Humanitarian Affairs said. I've been watching on the News. Headed to New Zealand, last report. Mr Cameron has donated 2 million pounds to help them! CHRISTCHURCH, New Zealand (AP) — At least eight people were confirmed dead in Vanuatu after a massive cyclone tore through the tiny South Pacific archipelago, and the death toll is likely to rise much higher once communications are restored with outlying islands, aid workers said Sunday. Packing winds of 270 kilometers (168 miles) per hour, Cyclone Pam tore through Vanuatu early Saturday, leaving a trail of destruction and unconfirmed reports of dozens of deaths. Chloe Morrison, a World Vision emergency communications officer in Port Vila, said officials from Vanuatu's National Disaster Management Office confirmed to her agency that at least eight people died in and around the capital, Port Vila. Officials have yet to assess the damage in many of the hard-hit outer islands because communications and power remain cut, she said. Morrison said she had heard reports of entire villages being destroyed in more remote areas. "People are really upset and it's really hard, just because for the last couple of years, we haven't received a really big cyclone like this one," said Isso Nihmei, Vanuatu coordinator for the environmental and crisis response group 350. "Most people right now, they are really homeless." He came upon one of the storm's victims on Saturday, while surveying the damage along the coastline with other relief workers. The group spotted a man lying on the ground, not breathing, and rushed him to the hospital. By the time they arrived, however, he was dead, Nihmei said. Structural damage across Port Vila was extensive, Nihmei said, with the majority of homes severely damaged or destroyed. Some residents began cleaning up what was left of their wrecked houses and checking on family members. Relief workers, meanwhile, were trying to get temporary shelters to victims as fast as possible, Nihmei said. "We're still not having communications with the other provinces," Nihmei said. "We're just running around trying to get information around Port Vila; with the other islands it's really hard to get anything." A westward change of course put populated areas directly in the path of Pam. The U.N. Office for the Coordination of Humanitarian Affairs said there were unconfirmed reports of an additional 44 deaths in Vanuatu's northeastern islands after Pam moved off its expected track. Residents awoke to much calmer weather Sunday after many hunkered down in emergency shelters for a second straight night, Morrison said. Many people who have ventured out from 23 emergency shelters around Port Vila have found their homes damaged or blown away altogether. Teetering trees and downed power lines have made parts of the capital hazardous. Morrison said communications have been so problematic that her aid group hasn't yet been able to account for many of its own 76 staff members on the islands. For anybody who wasn't in a secure shelter during the cyclone "it would have been a very, very tough time for them," she said. Vanuatu has a population of 267,000 spread over 65 islands. About 47,000 people live in the capital. UNICEF estimated that 54,000 children were among those affected by the cyclone. U.N. Secretary General Ban Ki-moon said the impact and scope of the disaster caused by the cyclone wasn't yet clear, but he feared the damage and destruction could be widespread. "We hope the loss of life will be minimal," Ban said Saturday at the World Conference on Disaster Risk and Reduction in Japan. The U.N. said it was preparing to deploy emergency rapid response units. The president of Vanuatu, Baldwin Lonsdale, who was attending the conference, told participants, "I do not really know what impact the cyclone has had on Vanuatu." "I am speaking to you today with a heart that is so heavy," he said. "I stand to appeal on behalf of the government and the people to give a helping hand in this disaster." Morrison said the first priority was to ensure people had adequate food, drinking water and shelter. Beyond that, she said, there would need to be a long and concerted rebuilding effort in the months ahead. New Zealand pledged 1 million New Zealand dollars ($734,000) to help with relief efforts. On Sunday, Australia pledged 5 million Australian dollars ($3.8 million) in aid, and sent in a relief team with supplies including water and temporary shelters. The small island nation, located about a quarter of the way from Australia to Hawaii, has repeatedly warned it is already suffering devastating effects from climate change with the island's coastal areas being washed away, forcing resettlement to higher ground and smaller yields on traditional crops. Scientists say it's impossible to attribute single weather events like Cyclone Pam to climate change. The cyclone has already caused damage to other Pacific islands, including Kiribati and the Solomon Islands. Authorities in New Zealand are preparing for Cyclone Pam, which is forecast to pass north of the country on Sunday and Monday. Associated Press writers Kristen Gelineau in Sydney and Elaine Kurtenbach in Sendai, Japan, contributed to this report. nicko wrote: Mr Cameron has donated 2 million pounds to help them! So sorry to hear how badly the two of you have been victimised by this typhoon. My atheist prayers are with you and your loved ones in this dark hour. Sarcastic remarks do not a good editor make! * OTHER "rich" countries - such as Japan, S. Korea, the USA, Canada, Germany - will be no doubt be seen to be making donations through the UN agencies and 'relief aid' arms of several charities..
AND 'Foreign aid' donations from such countries as Oz, NZ and Japan are likely to keep on flowing that way for another couple of decades. Shame that Britain and France could not find the same 'enthusiasm' for humanitarian relief that they found for colonialism. nicko wrote: Sarcastic remarks do not a good editor make! Original Quill wrote: Shame that Britain and France could not find the same 'enthusiasm' for humanitarian relief that they found for colonialism. From a Yank, when America has invaded and interfered in more countries than anyone else put together!.